Rob's Idaho Perspective: The Eight, Wait… Nine Woodpeckers of the Targhee National Forest! The Eight, Wait… Nine Woodpeckers of the Targhee National Forest! This last week I spent eight days in eastern Idaho launching my second major field project of the year which involves surveying for eight woodpecker species within the Targhee portion of the Caribou-Targhee National Forest. This is the second year of this program and one in which I participate in all aspects - survey design, recruiting, hiring, execution, data analysis, and reporting. It was great to get back in the forest and experience the fantastic beauty it has to offer. The project is primarily implemented by a two person team that I hired and spent the week training. I then completed a few survey routes by myself on my way home, increasing our overall sample size. My solo survey, Western portion of Targhee National Forest near Lone Pine, Idaho. My crew consists of two students, one from BYU-Idaho and one from Weber State. They will work for eight weeks within the forest surveying for the eight woodpecker species that regularly occur in the area – Red-naped Sapsucker, Williamson’s Sapsucker, Downy Woodpecker, Hairy Woodpecker, American Three-toed Woodpecker, Black-backed Woodpecker, Lewis’s Woodpecker, and Northern Flicker. Early morning moon, Western portion of Targhee National Forest near Lone Pine, Idaho. Most of our woodpecker surveys consist of detecting woodpeckers by sounds. Probably 90% of the birds we detect are never seen. However, we do often get dramatic responses to our calls. Our protocol requires silent listening for six minutes at each point and then transitions to call-broadcast. These call broadcasts essentially double our chances of detecting a woodpecker that is present at the point. It often results in the birds calling back, but occasionally the birds fly in to investigate the source of the call. As I told my team, playing the call is equivalent to walking into a strangers house and yelling out that you now own the place. It is not a polite thing to do. It is for this reason that I only endorse this method when justified by specific study protocols. In one instance we had two pairs of Red-naped Sapsuckers converge on us from two directions. Apparently we were right on the border between their territories. Both pairs landed in the same tree and then began screaming at each other. They completely ignored our presence. Red-naped Sapsucker near Alpine, Wyoming, Caribou-Targhee National Forest. The highlight of the week occurred at one of the most unexpected of times. After a tough day of surveys, my crew was napping in camp. I was sitting in the cab of my field truck reading a book. Earlier, I had taken a photo of a Red-naped Sapsucker on a tree about 30 feet in front of me. At a chapter break in my book, I glanced up and saw an unknown woodpecker in the same location. It had an all black back and red from the back of its neck to the top of its head. As I was in the area to study the eight common woodpecker species, I immediately realized it was NOT one of those! It was also not one of the other two species occurring in Idaho. Woah! Wow! It turned its head and I saw that it was an Acorn Woodpecker! I had seen Acorn Woodpeckers in Belize, but nowhere near Idaho. It flew off before I had a chance for a photo. Dang! I looked up the range maps and the map of all historical sightings. Nowhere near eastern Idaho! This was going to be a tough sell given that I had no photo evidence. eBird map of all historical reports of Acorn Woodpeckers. Well, as luck would have it, a number of Idaho Birders were intrigued enough by my report to make the journey. The next day after completing my day of work in the field, I returned to the area to find four carloads of birders in the area, two of which arrived early enough to find and photograph the bird. The others were too late as has been everyone else that has searched the area over the past week. Thus the bird has only been observed by four people. My friend Jake (second person to find the bird) was kind enough to provide a copy of one of his photos for official Idaho Bird Record Committee report and for this blog. Thanks Jake! 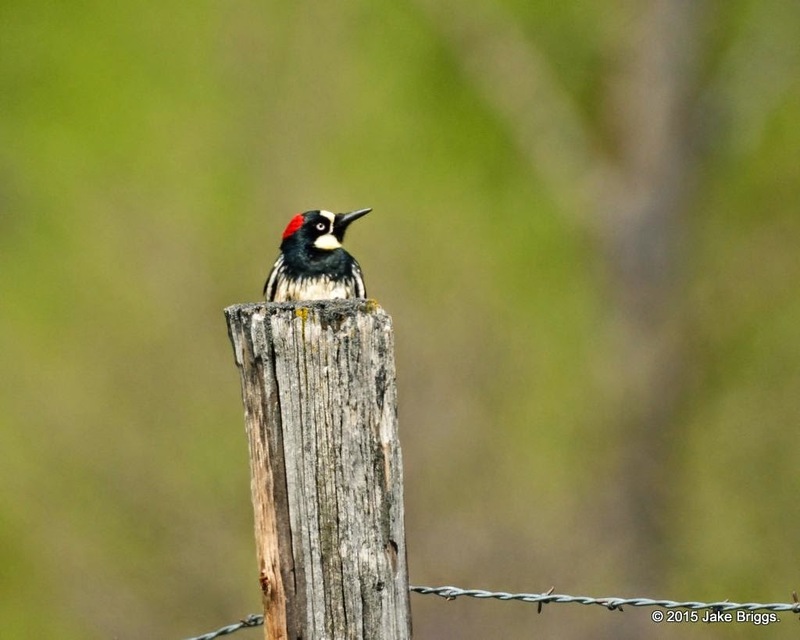 Acorn Woodpecker near Swan Valley, Idaho, the first ever reported in Idaho. This was definitely the highlight of the trip and the highlight of my birding experience. It is the rarest bird I have ever had the opportunity to find and report. As with all of my field work, just being outside provides opportunities to observe great things in nature. I particularly liked these cacti occurring on dry rocky slopes at 8000 feet above sea level. This area would have been covered in snow as little as three weeks earlier, but is now very dry and appropriate for the hardy plants. None had yet bloomed. Who doesn’t love Mountain Bluebirds? This male/female pair appear to “not be talking to each other!” Ha. I also love Ruffed Grouse. They have a tendency to freeze in the middle of the road when surprised. They then move in slow motion to the side. It is a great spectacle to watch. My crew is now trained and working on their own. I have returned to Boise for some office work and to be trained in Hummingbird banding. The Intermountain Bird Observatory has established an annual banding project in Idaho City. This year I will be trained as one of our banders. The next big field project will be my Northern Goshawk work within the Sawtooth National Forest which kicks off in June.